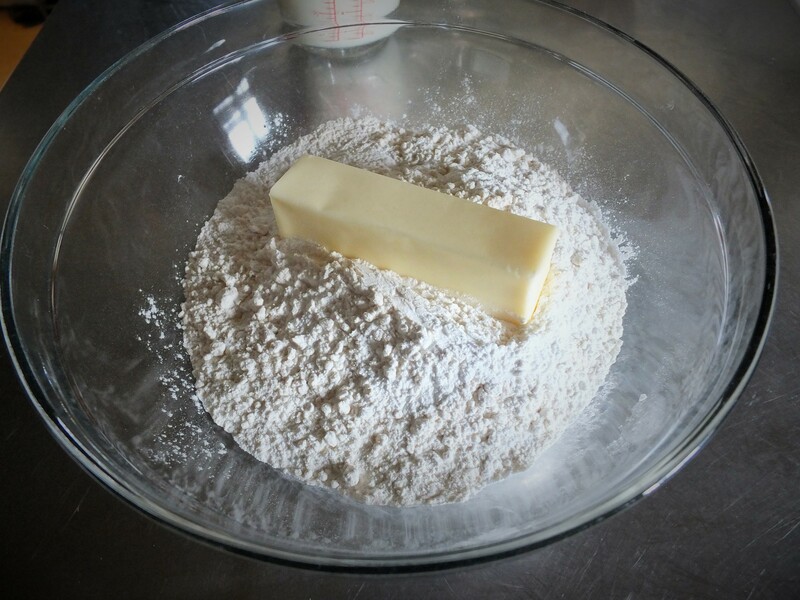 I thought I would give some closure to my last post by providing a simple scone recipe. 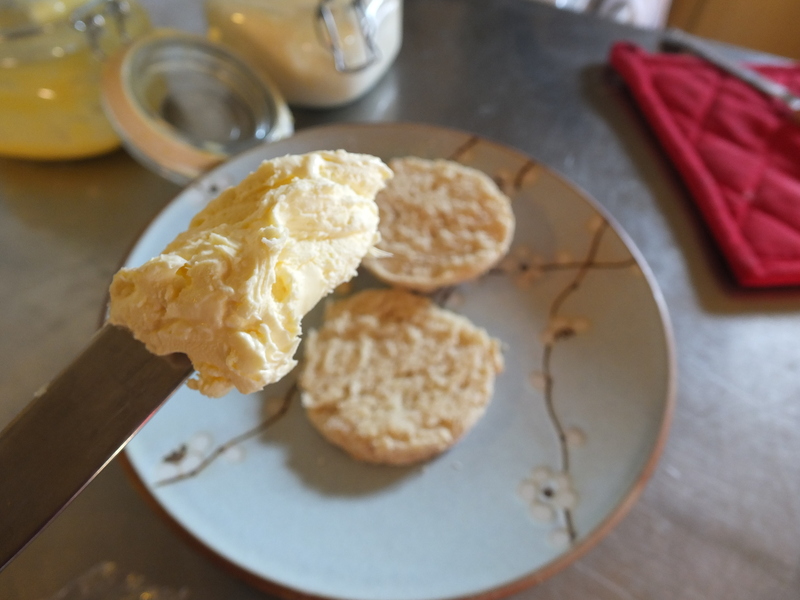 After all, we need a good excuse to use our delightful new discovery- Cornish (clotted) cream. 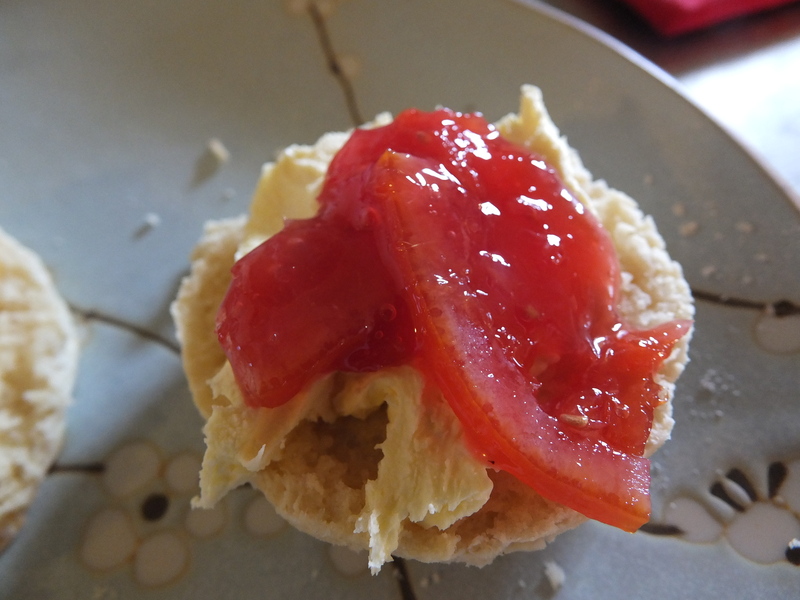 Now I grew up eating scones quite often. Living in western Washington state, I was a frequent visitor of the Puyallup Fair (only true Washingtonians can say that name). This fair is one of the top ten largest fairs in the nation. And this fair happens to be famous for it’s ‘Fair Scone,’ a triangular bit of pastry served hot with a dollop of jam which drips down your hands as you visit the impressive livestock or the prize-winning pumpkins and then try to decide which nausea-inducing rides are worth waiting in line for. 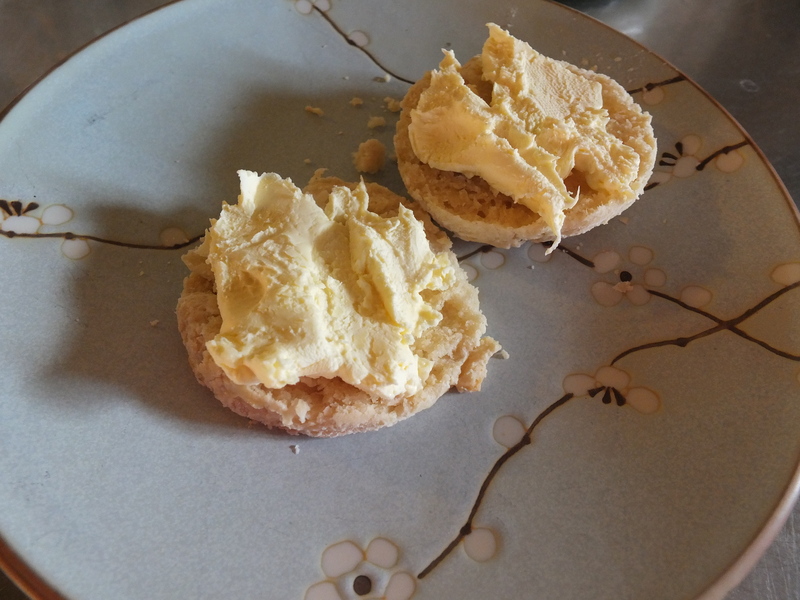 Almost everyone I know out west has a ‘fair scone’ recipe in their arsenal, and don’t get me wrong- they are tasty, and would work just fine as a vehicle for your cream. 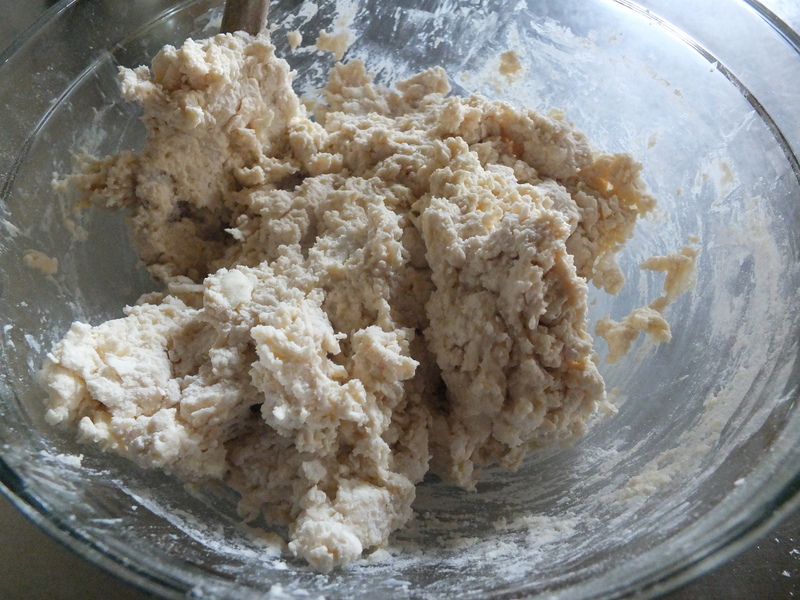 First combine your dry ingredients in a medium bowl, and then plop the whole stick of butter on top. 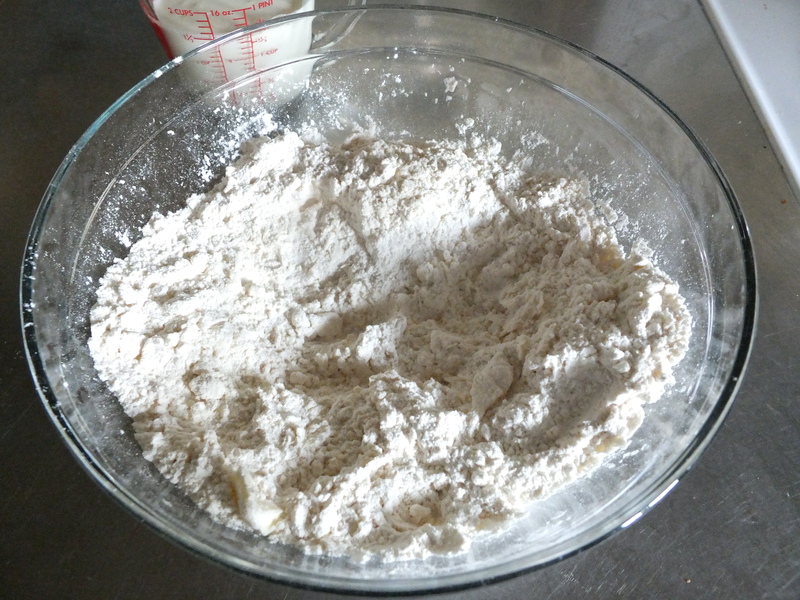 Then, with a pastry cutter or your fingers, crumble the butter into the flour until it looks good and crumbly. 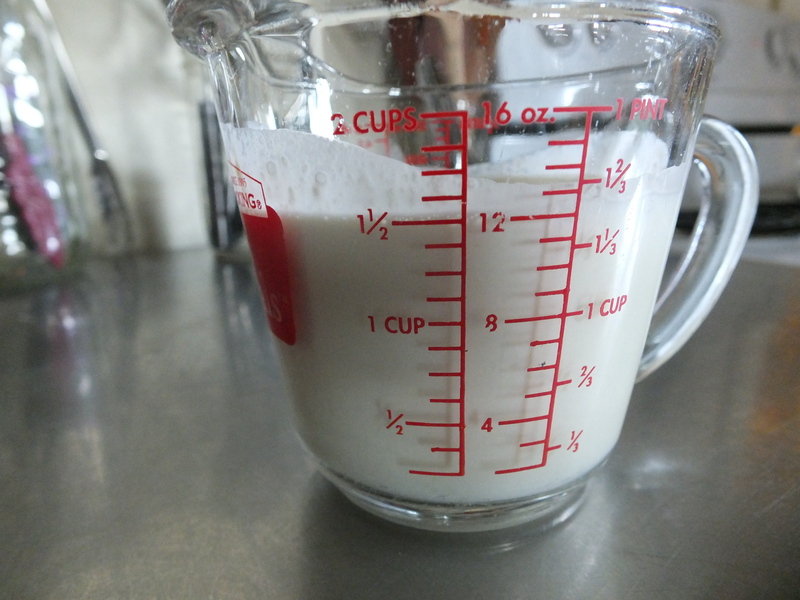 Now just pour in your cream. 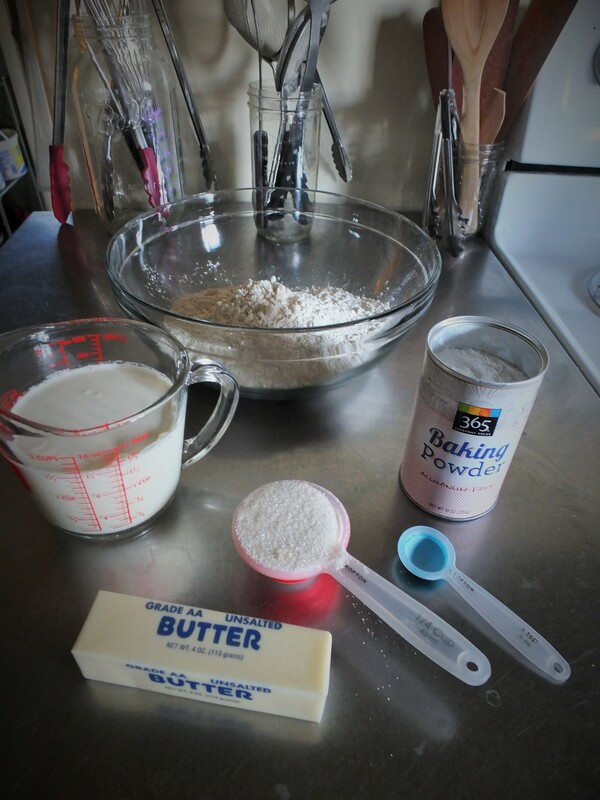 I am using the leftover liquid from the clotted cream recipe here, plus a little regular whipping cream. 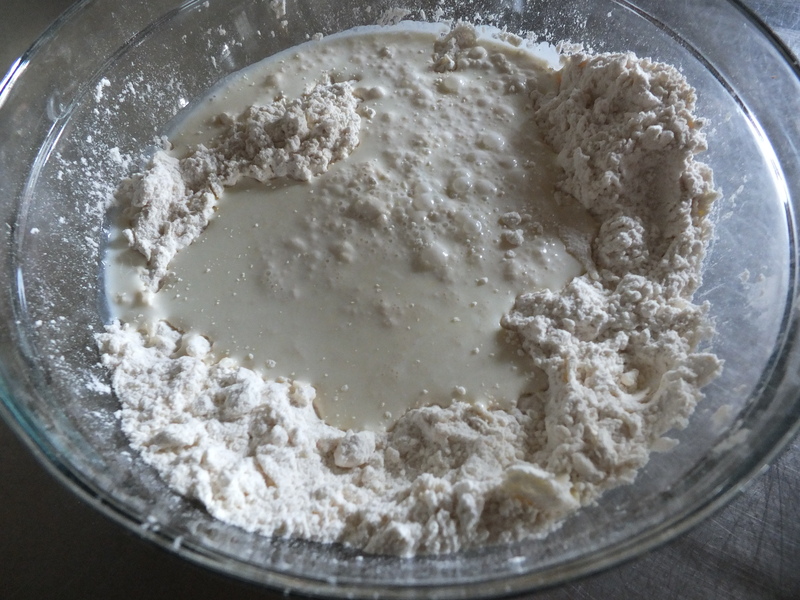 Gently stir together until it forms a nice lumpy mass, and plop it straight onto your baking sheet because don’t you hate cleaning up sticky, floury counter tops? 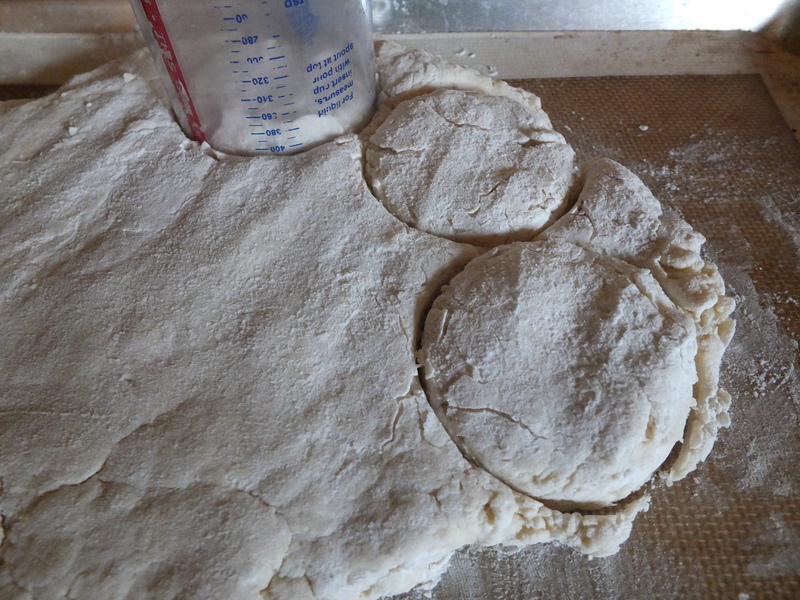 Using floured fingers, gently press your dough into an irregular shape and get out a smallish glass or biscuit cutter. 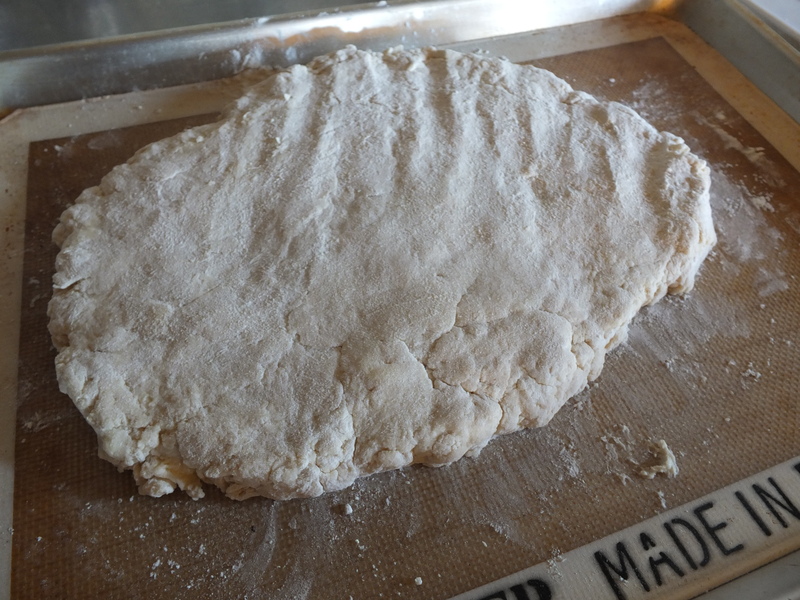 Or you can form it into two circles and cut it into wedges if you like. 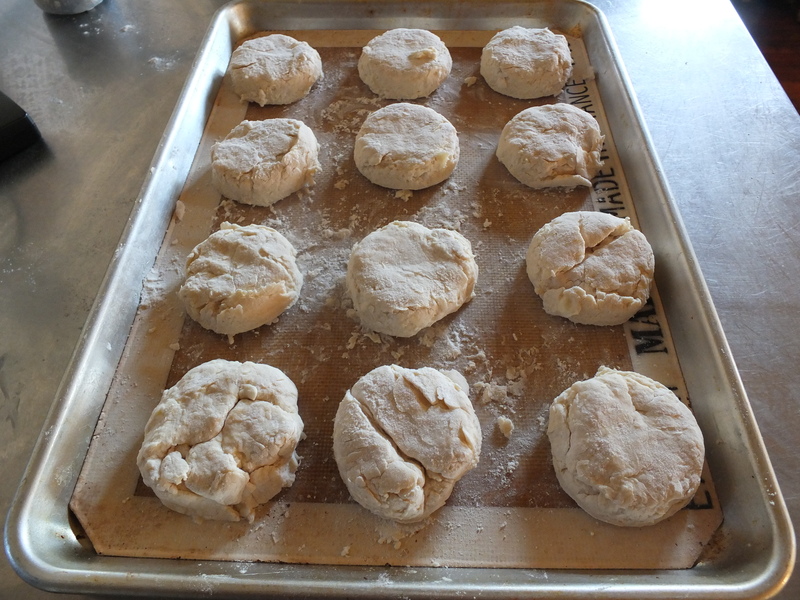 Preheat your oven to 375 degrees and put your scones in to bake for about 15-20 minutes. 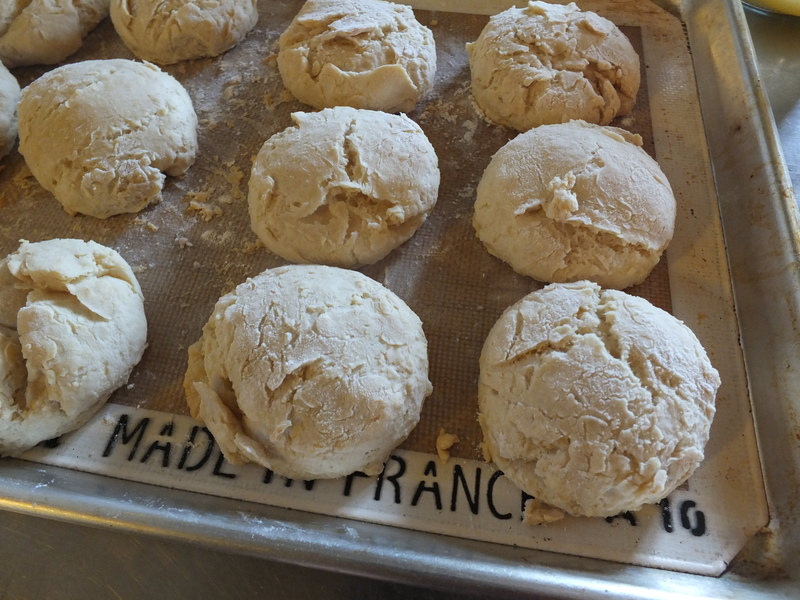 They don’t get very golden on the top, so gently lift one up and see if the bottom is browned- that means they are done! Now slice one in half, and get ready. 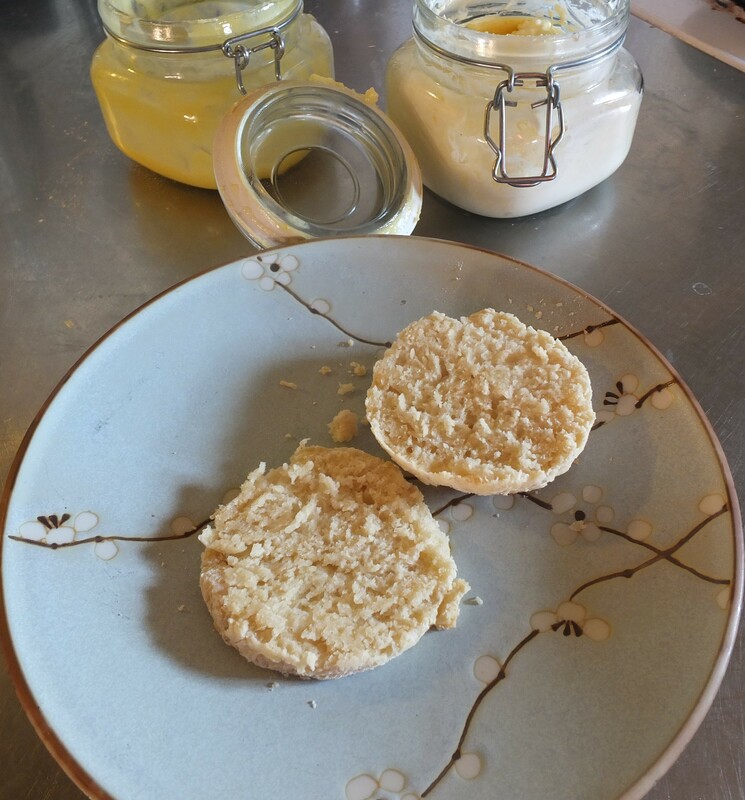 Traditionally, these scones are served with clotted cream and either lemon curd, marmalade or jam. 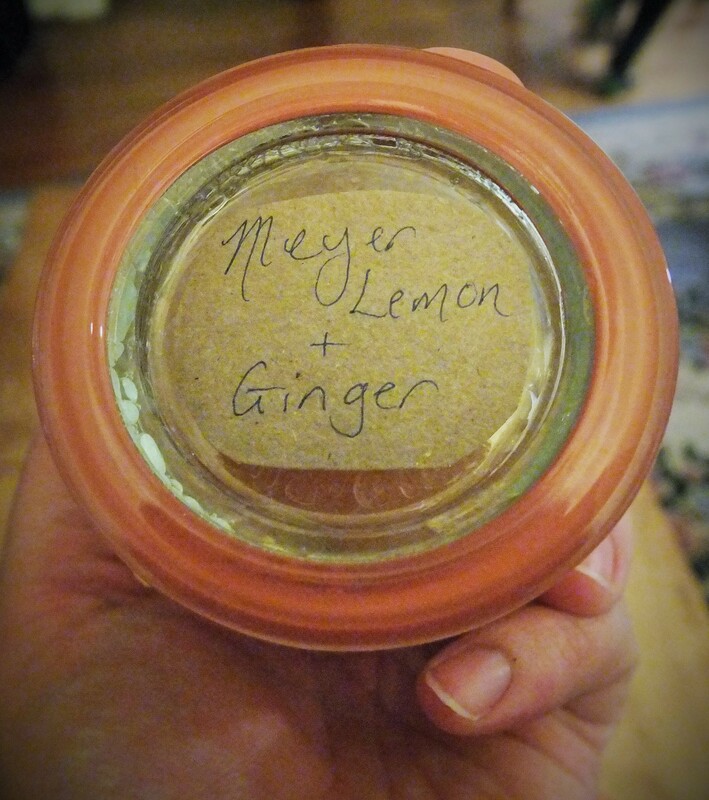 I thought about posting a recipe for lemon curd, but I was too lazy, and so I am putting a link here for the easiest lemon curd recipe I have found. 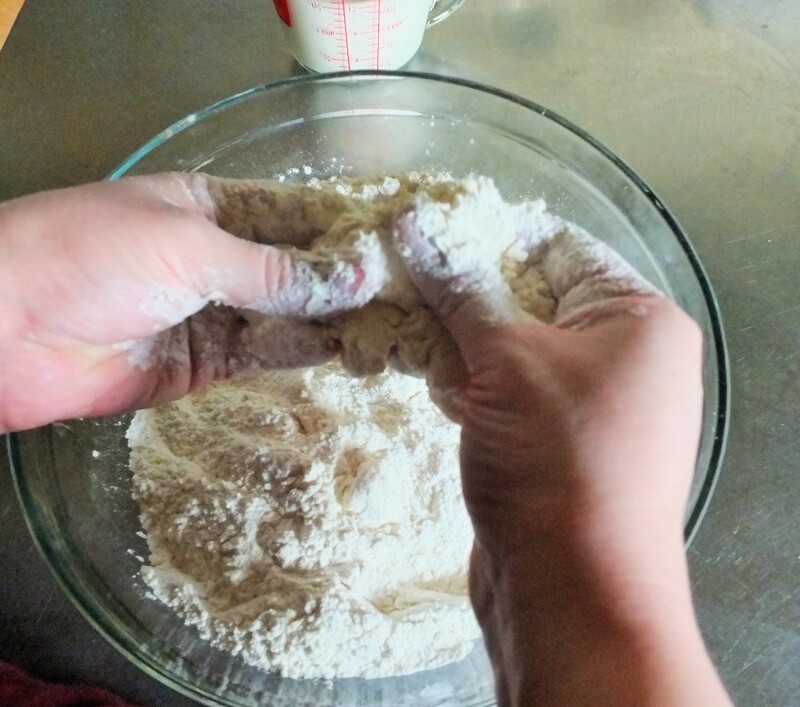 But there are a ton of other recipes out there or (gasp) you can buy it in specialty stores. 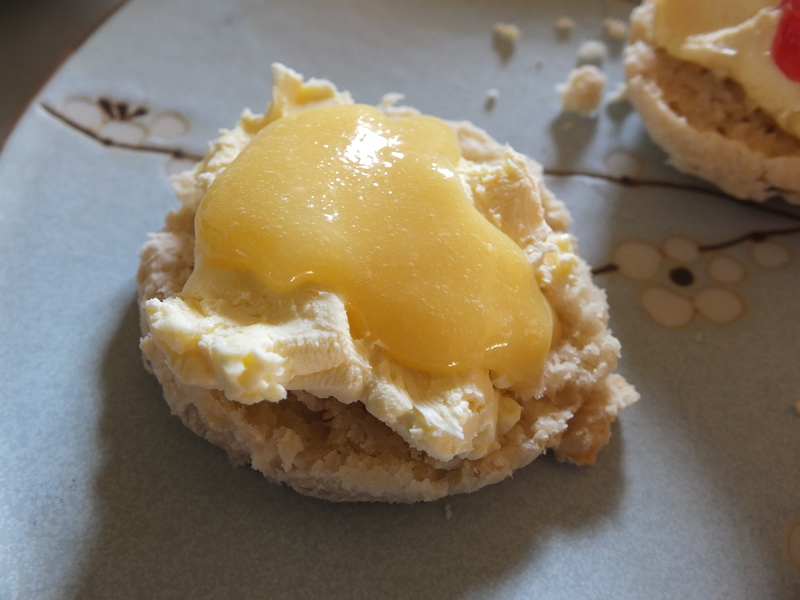 If you are not familiar with lemon curd (yet another food product that deserves a better name) it is a lemony, silky, buttery custard that is the best partner (in my humble opinion) for clotted cream. 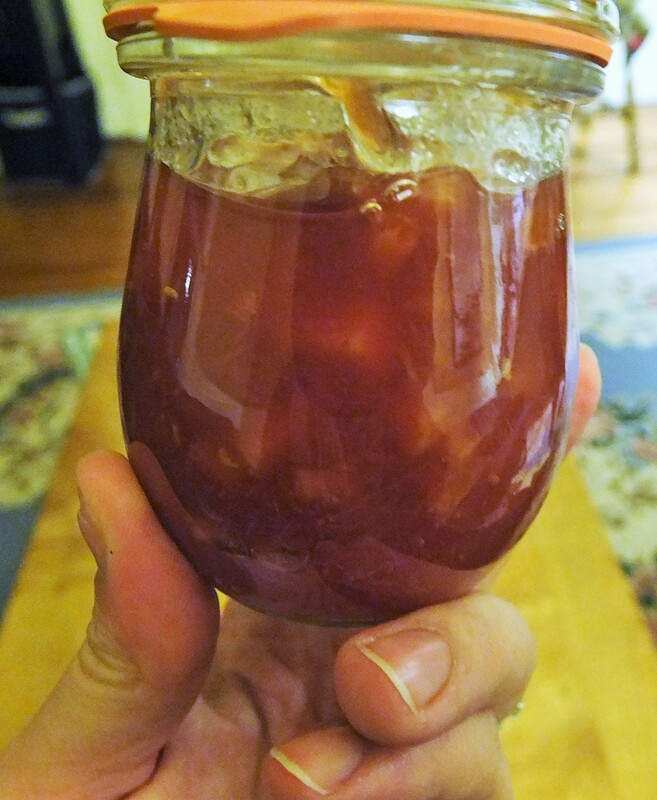 If you are like my husband, you might prefer a nice marmalade. 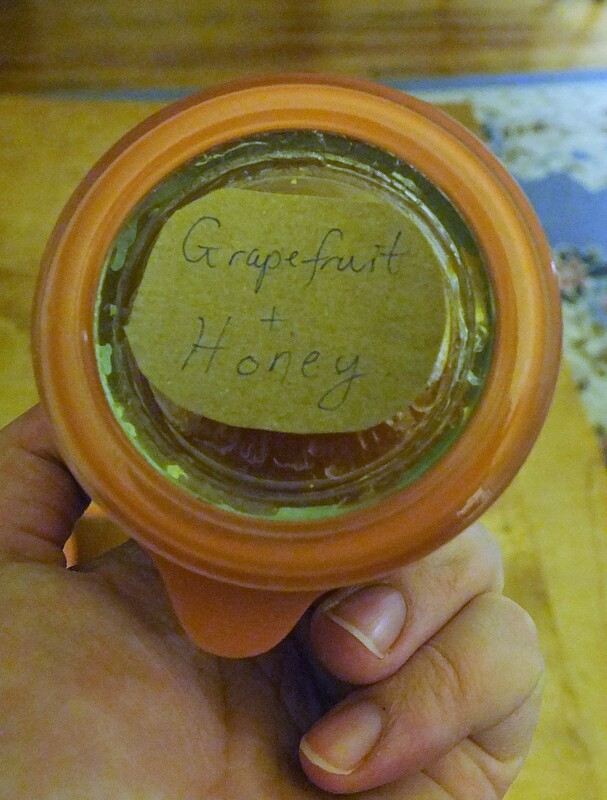 Perhaps I am generalizing, but I think marmalade is an acquired taste for most Americans who aren’t used to slightly bitter flavors in their food. It has certainly taken me a while to appreciate it, but I will never like it quite so much as my hubby. 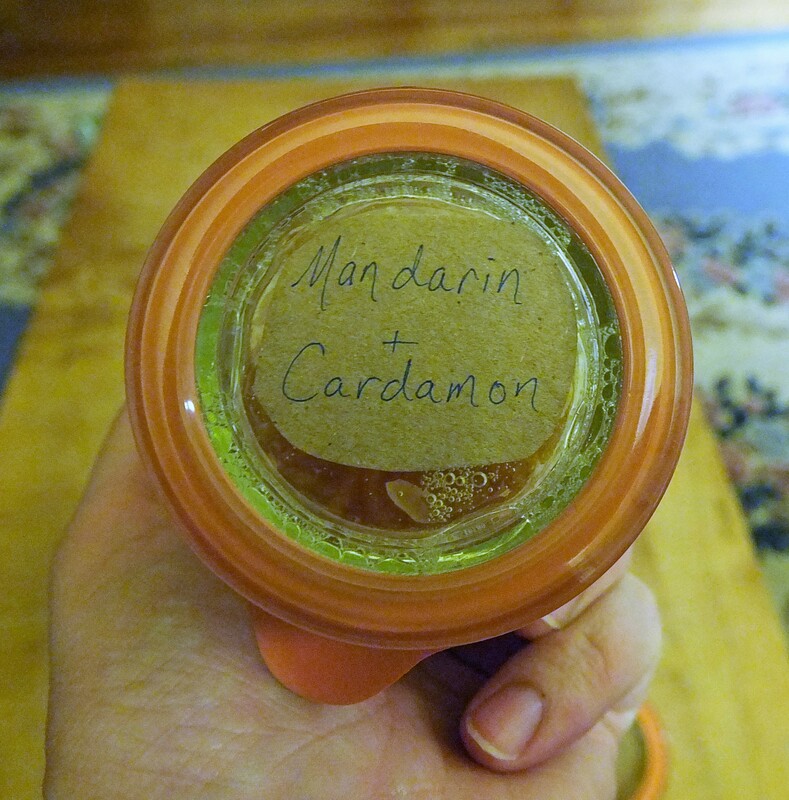 In fact, for Christmas this year, the boys and I made him a whole collection of different marmalades to enjoy with the clotted cream gift. 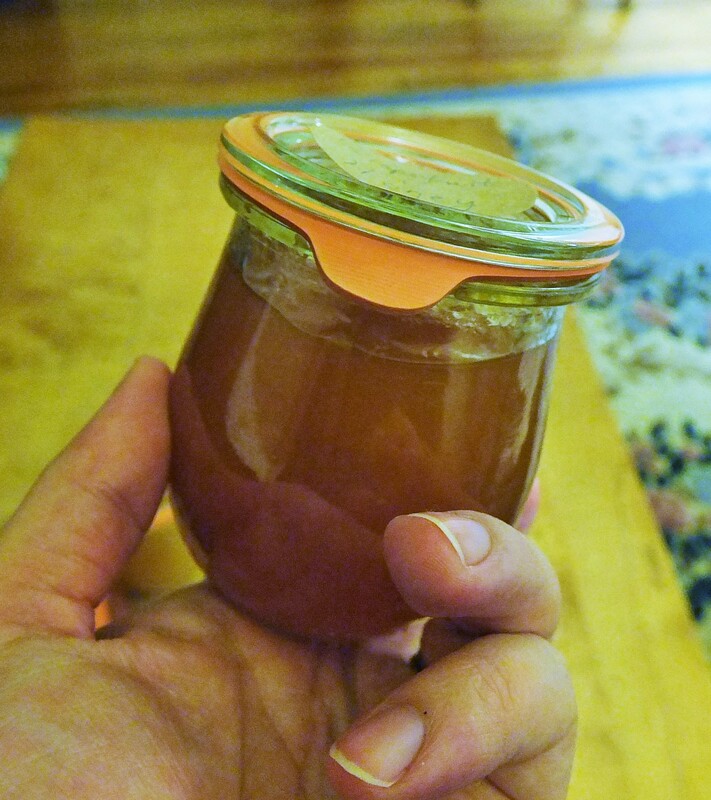 I just loved these cute little Weck canning jars. I’m thinking of starting a collection. 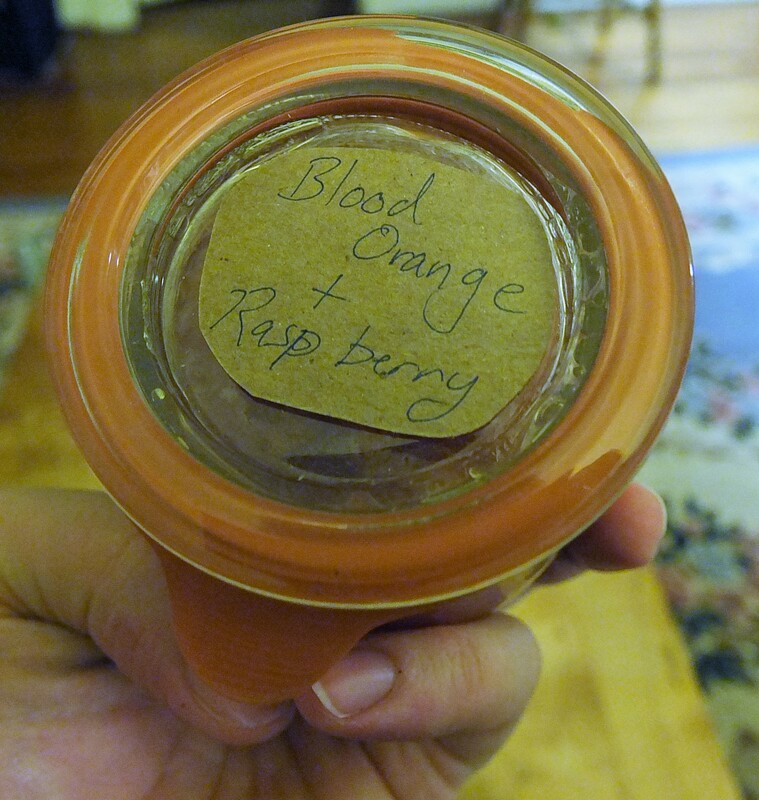 Of course, any of your favorite jams are nice as well. 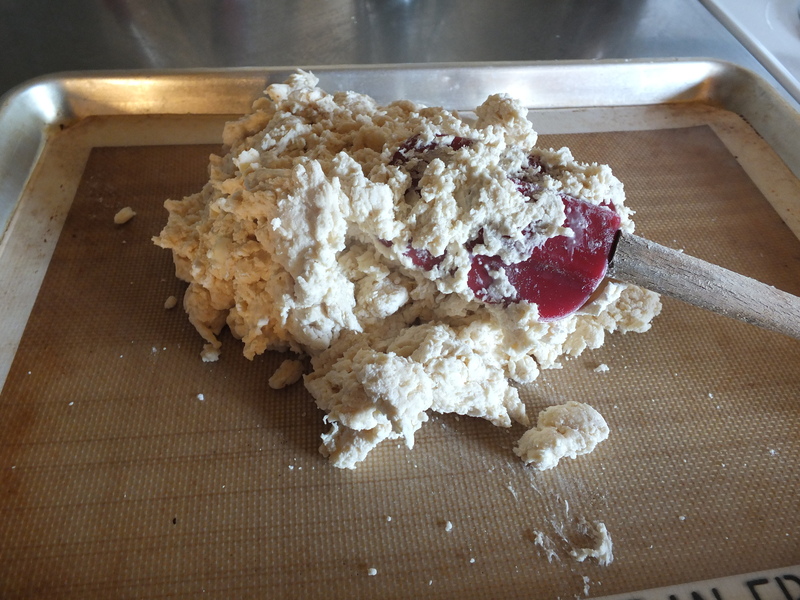 So now that you have picked your poison, let’s build our scone! 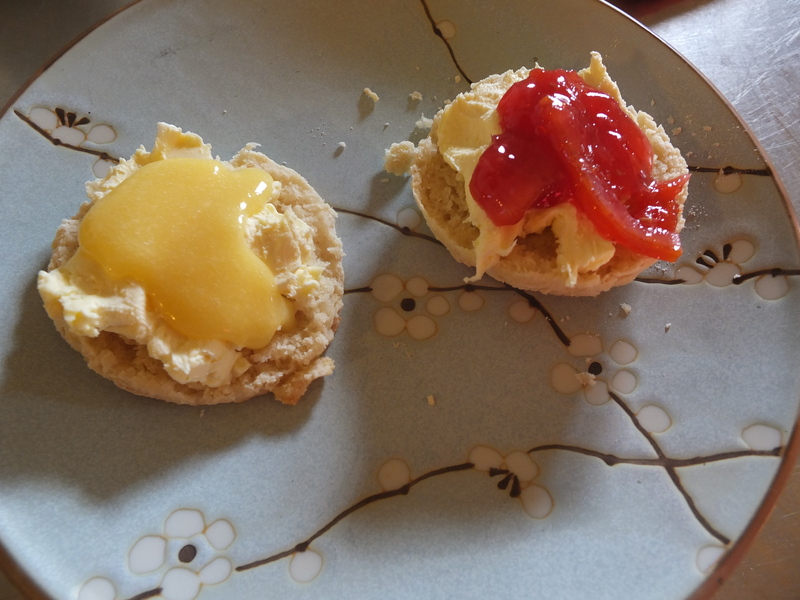 Start with a generous helping of the clotted cream, and I do mean generous. You have to be able to sink your teeth into it, or you won’t enjoy the full experience. Of course scones are supposed to go with afternoon tea, but I have found them to be quite as delightful with my morning coffee. I hope you all enjoy! Cheerio!